Lacrosse balls were originally used exclusively for the sport of lacrosse. Made of 100% rubber, many have since found that it has the perfect firmness and shape for use as a massage therapy tool. 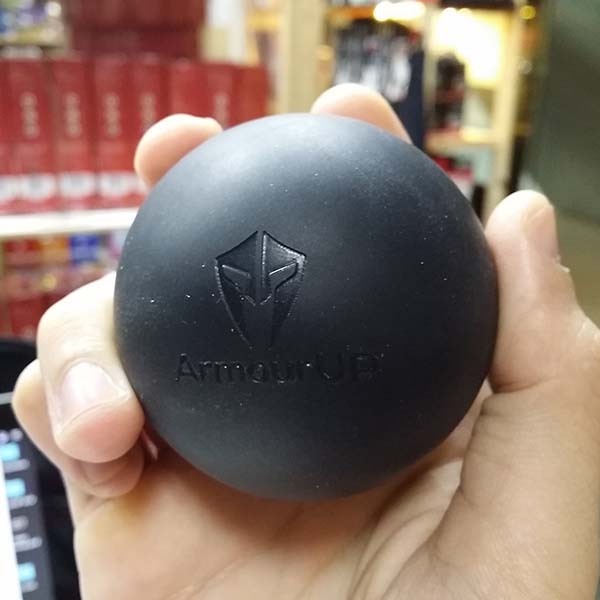 A lacrosse ball is also an inexpensive way to help you recover from tough workouts. By exerting pressure with the lacrosse ball, key trigger points and tight muscle knots can be reached and worked on effectively. Known also as myofascial release, this massage can provide great pain relief and soothe muscle soreness from a hard workout. Gently place the ball on tight muscle and apply pressure. Hold for 15 sec and move to the next spot, and continue until the spot stops hurting. Use this to warm up before lifting as it can help to increase your mobility and reduce the chances of injury due to tight muscles. May be used on back, hamstrings, shoulders, chest, neck, calves, or any parts of the body where tight muscles can be found. *Slight pain and discomfort is normal. Stain resistant, given the color. Cute ArmourUp logo too.